Kath and I travelled to Edinburgh on Thursday morning after the Foo Fighters concert. It is a long drive, having enjoyed the gig a lot the night before, we listened to most of the Foo Fighters albums en route and then moved onto the the Manic Street Preachers Holy Bible. It was the first time Kath had listened to whole album and I made her read the lyrics. It is a dark album full, but cleverly written so I hoped she would like it. We arrived and checked into the hotel. Then, curious of what was out there, took the 15 minute walk to the town centre, we strolled through some of the Royal Mile before finding somewhere to eat. Fancying something spicy we tried out the Gurkha cafe and restaurant. It was excellent Nepalese food, even better than the Ayo Gurkhali back home in Wilmslow. Feeling full but not ready for bed we decided to go and watch a film. There was a small Odeon cinema hiding underneath a restaurant on the way back to our hotel. We watched the modern remake of Poltergeist, it passed the time for our tired brains. Then went back to the hotel for a well deserved rest. Our first full day in Edinburgh we headed to the Castle, starting with the excellent free walking tour then exploring the many buildings there, including the Scottish Crown Jewels. After the Castle we decided to grab a bite to eat at the Albanach. A charming pub restaurant on the Royal Mile. While eating our fish and chips Kath got her IELTS results, which she passed brilliantly! With an extra spring in our step, food and a few drinks in our belly we walked along the Royal Mile to Holyrood. There we had a wonder the very modern Scottish Parliament building on our way to the Palace. The Palace was impressive however its mostly faded glamour, the grandeur was put in a long time ago and is simply maintained. It was interesting to see the place where Mary Queen of Scots lived and her confidante David Rizzio was killed. In spite of all the walking we decided to go on an evening ghost tour. There are many walking tours which tell about the dark heart of Edinburgh, stories about the body snatchers Burke and Hare, the disputed final resting place of David Rizzo and infamous villains of the Cowgate were all brought to life by our guide. It is clear there is a lot of grizzly history to draw on. Saturday we planned to see the Manics in the evening, but we started the day by going on the Edinburgh parkrun. It was the best parkrun we had done so far, taking place outside the city on the Cramond/Silverknowes Promenade. We took it easy and enjoyed jogging in such nice surroundings and glorious weather. After a shower and a change, we spend the day taking in the Scottish National Gallery. There are some amazing works in there including those by Rembrandt, Turner, and Degas. It is large and took us quite some time to walk around. In the evening we went out for some sushi before heading to Usher Hall. 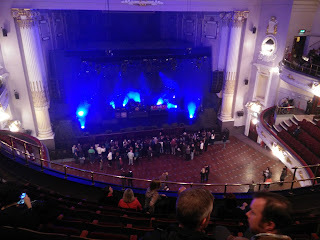 Usher Hall is quite an impressive building, we had seating on the top but the view was good. Unfortunately the seats were pretty uncomfortable, I was actually glad that there was an interlude so I could stretch my legs. The Manics did a full rendition of the Holy Bible complete with 90's era costumes. Then a set of their greatest hits. I really enjoyed the venom of the Holy Bible you can see how much they have changed especially songs like Your Love Is Not Enough.